On July 21, 1971, the Holiday Inn in Fairfax City, Virginia bustled with activity. The Virginia State Advisory Committee to the U.S. Commission on Civil Rights (VSAC) held a press conference to release the findings of a report compiled the previous spring detailing the current state of racial integration at George Mason College. College Chancellor Lorin Thompson almost certainly knew that the report, which was titled: George Mason College: For All The People?, would most likely chastise George Mason for not having many minority students, but he was probably not ready for the VSAC’s declaration that, “George Mason College was conceived of, by, and for the white community of Northern Virginia and not for the entire Northern Virginia population.” The report concluded that: there was no affirmative action system in place at Mason to recruit minority students; “stiff admission criteria” discriminated against minority applicants; there existed a lack of African American history-related courses; and the college exhibited only “half-hearted support” for a program to assist “educationally-disadvantaged” students. The Commonwealth of Virginia had been relatively slow in desegregation of its public higher educational institutions. A part of the state government which had at one time promoted the policy of discrimination against African Americans in education, particularly during the period of “Massive Resistance” after the Brown vs. Board of Education ruling in 1954, state colleges and universities in the Commonwealth only began to admit persons of color in numbers during the late 1960s. In 1969 University of Virginia President Edgar F. Shannon commissioned a committee under faculty member William Rotch to study how best to increase African American enrollment at Charlottesville. The “Rotch Report,” as it came to be known, recommended that the University must make it known that blacks are welcomed and hire administrators who could make certain that black students and faculty were recruited and retained. The University at Charlottesville under President Shannon took a serious approach to this policy suggestion. But it was an inescapable fact that African American enrollment at Mason was indeed very low during the first fifteen years of its existence. There were some occasional black and international students at Mason, but never more than a handful at any one time. During the 1970-71 academic year, when the VSAC conducted its study, there were sixteen black students out of a total of 2,456. Of 164 total faculty members, only two were black. The VSAC sought to find out why. The VSAC interviewed various members of the campus community (students, faculty, and staff) during the spring of 1971 in order to get input on the racial situation at Mason. Some African American students told committee members that they experienced “animosity” in dealing with white students. They felt that textbooks were geared more toward white students. Some faculty members reported that the few courses designed to teach African American studies had little administrative support and were sometimes discontinued. The VSAC found that while the University of Virginia in Charlottesville had implemented many of the suggestions in the Rotch Report, administrators at George Mason College had not yet done so. The committee concluded the report by listing several recommendations for how to improve minority relations at George Mason. The recommendations included appointing an African American to George Mason College’s board of advisors, the establishment of performance standards geared toward African American students, and the hiring of a staff member whose full-time job was to assist minority students attending George Mason. Once George Mason College gained independence from the University of Virginia, an effort to bring more minorities into the campus community began. One example was the appointment of two African Americans from the area, Lutrelle F. Parker and Elias K. Blake, to the to the university’s first Board of Visitors by Governor A. Linwood Holton, Jr. in 1972. Parker was a lawyer and official in the U.S. Patent Office, while Blake was an educational consultant and later president of Atlanta's Clark College. However, despite the initial efforts of university administrators to formulate policy, it was still seen by students, staff, and others as not enough. The student-run Broadside ran an editorial in September 1972 complaining that certain members of the Admissions Office lacked the necessary experience to work in an integrated campus. A letter to the editor in a November 1972 edition of the Broadside urged the Student Government, along with the administration, to create a task force to advance minority enrollment and help ease tensions related to minority affairs within the university. In December of 1972, an ad hoc committee formed by Mason’s administration found that there were several discriminatory practices in place at the University, especially with regard to recruiting and housing minority students. In July 1973, Lorin Thompson retired as the President of George Mason University and was succeeded by Dr. Vergil Dykstra of the State University of New York at Binghamton. Dykstra was a Midwesterner who spent much of his previous career in northern university settings and was a strong advocate of integration and Affirmative Action. One of Dr. Dykstra’s first priorities as president was to increase the number of minority students applying to, accepted by, and enrolling at George Mason. In order to achieve this goal, Dykstra created the first Office of Minority Recruitment (OMR) at Mason. Its charge was to increase the admission rate for minority applicants. The OMR challenged the Office of Admissions to become both more aware and accepting of minority students. But the new administration did not stop there. Dr. Dykstra replaced the University’s Director of Admissions with an administrator who was seen as more suited to working in an integrated academic institution. 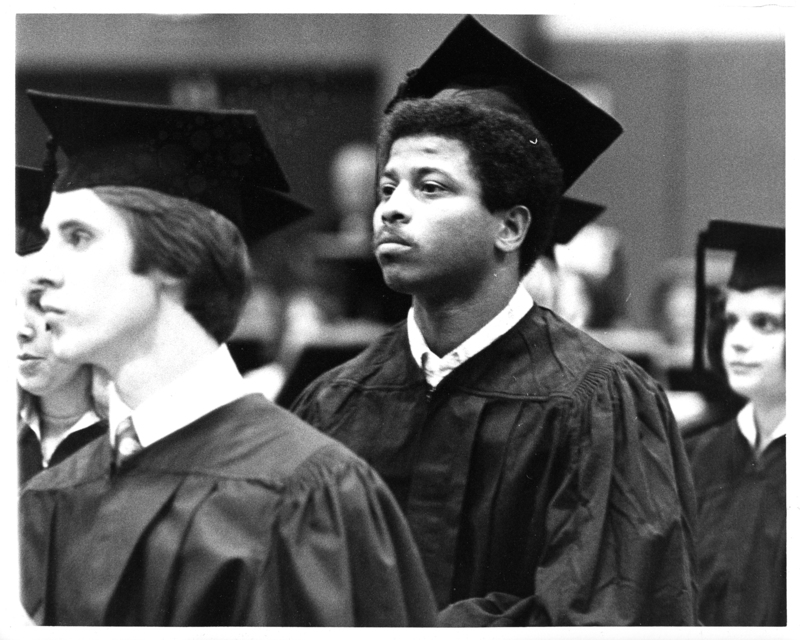 In March of 1974 the Office of Admissions, at Dykstra’s urging, hired Andrew (Andy) Evans, the University’s first-ever African American admissions officer. Evans was tasked with recruiting minority applicants. During Evans’ first year, enrollment of African American students to George Mason University doubled. Other changes included adjusting academic standards for minority applicants, which was met at first with some criticism. The criticism would recede as students proved that they were up to the task of college-level work. That fall, religion Professor Darius Swann was appointed Special Assistant to the President for Minority Affairs and was the first Mason faculty member whose sole job revolved around assisting existing minority students. Dr. Dykstra resigned his post as president in 1977, but not before changing George Mason University forever with respect to diversity. Through his efforts, Dr. Dykstra was not only able to increase the number of minority students at George Mason, but also strongly encourage the hiring of minority faculty members. Dykstra’s successor, Dr. Robert Krug, would continue the legacy of affirmative action, most notably by introducing formal affirmative action conferences at the University in the fall of 1977. In addition, special academic scholarships were offered to African American students in order to help alleviate their previous financial concerns. In 2010 George Mason University received recognition from the Education Trust for having one of the nation’s highest minority graduation rates. George Mason’s student body hails from over one hundred thirty nations, while one in every four undergraduates identify themselves as African American or Hispanic. George Mason University has been considered one of the most diverse higher education institutions in the nation. Browse items pertaining to initiating a change towards diversity at George Mason University. George Mason College: for All the People? Virginia State Advisory Committee to the U.S. Commission on Civil Rights, July 1971.